HYDERABAD: This 68-year-old former Road Transport Corporation (RTC) employee could have put his feet up and enjoyed his retired life. Instead, he wakes up every morning, at the crack of dawn, to motivate youth aspiring for a career in the police department. 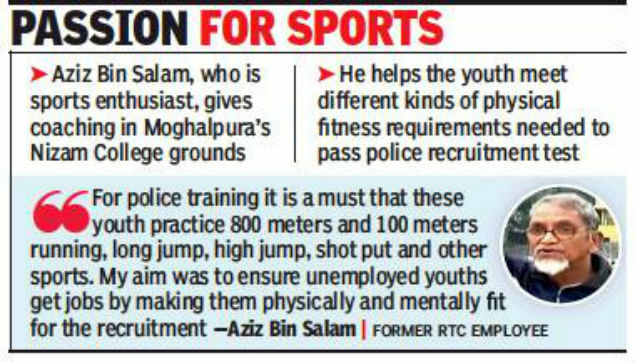 Aziz Bin Salam, who is a sports enthusiast, gives free sub-inspector and constable coaching to youth in Moghalpura's Nizam College grounds. Driven by his intense passion for sports and armed with the objective of helping youngsters take the right path to success, Aziz had been going to the ground every single day for the past three years to train youth to help them meet the different kinds of physical fitness requirements that are needed to pass the police recruitment test. Aziz’s goal is to improve the quality of life of youngsters in the city and fellow residents and help them gain employment. “It is really inspiring to see Aziz sir train the youth and keep himself fit even at this age. We do not feel like taking a day off from training when we see him come to the ground every single day and train us with so much passion. It is really motivating,” said M Samyukta, one of the police service aspirants. Aziz began his career in RTC in 1873 and retired in 2008. While working with RTC, he won medals in running, longjump, high-jump, among others. He has bagged about 105 gold, silver and bronze medals till date. The septuagenarian said it is his love and passion for sports that motivates him to go to the ground, exercise and train youth even at this age. “It is because of this habit that I am fit and have no health issues. My goal in life is to help others and I am doing that by training the youth who come here for police training. It gives me immense satisfaction to think that these kids will go ahead and become successful people,” Aziz said.